A new study shows just how frustrated CIOs are with the state of app development in their enterprises: Half say developing a mobile app takes too long, and they also complain about high costs. In an industry where the demand of mobile business apps continues to rise, these issues can create problems for mobilizing enterprises quickly. While hiring more app developers sounds like it would decrease the time to build a mobile app, application developers are in short supply and the amount of time it takes to find one can delay building your mobile apps for months. The survey by Kinvey, "State of Enterprise Mobility Survey" found that 50 percent of CIOs say that app development takes too long. The survey shows there good reason for that, because it finds that 56 percent of mobile leaders report that it takes from seven months to more than a year to build a single mobile app. Another 24 percent say it takes between four to six months. Only 11 percent say that it takes between one and three months. (Nine percent weren't sure how long it takes.) As for the cost of enterprise mobile app development, the price tag is surprisingly high. On average, it costs $270,000 for each app to be developed. A full 18 percent of those surveyed says it takes from $500,000 to more than 1 million to develop a single app. Not everyone can afford the high price of mobile apps. The survey also finds that CIOs are caught between the past and the future when it comes to moving to mobile. When it comes to why their companies have been unable to advance their mobile strategy, it's clear that they haven't yet revamped their tools and skillset for mobile. Fifty three percent say their technology was built for the Web, not mobile, 50 percent say they don't have the right tools for developing for mobile, and 43 percent say that their developers have the wrong skillset. If you look behind the numbers, it's clear that both slow development and the high cost of enterprise mobile app development share the same cause: Companies have a skills and technology gap between Web development and mobile development, and the enterprises are caught in the Web-based past. It needn't be that way. 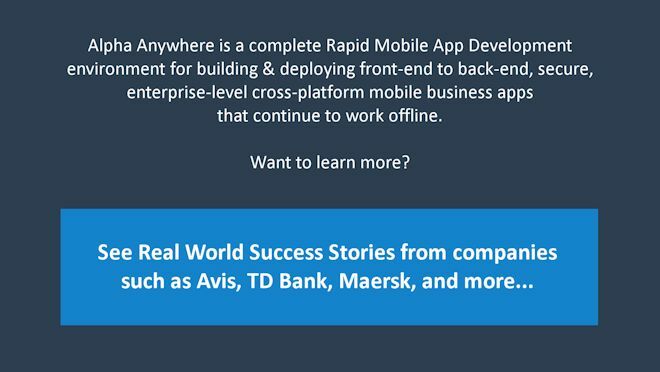 Using Alpha Anywhere for both Web and mobile development can dramatically reduce the time it takes to build enterprise mobile apps, and significantly cut costs. It also addresses the skills gap, because its approach allows people to build mobile apps with a low-code approach, which means they don't need to have mobile-specific coding expertise.